I’ve fished Pickwick Lake for over 30 years. That includes guiding all throughout this 50 mile long impoundment for both smallmouth bass, largemouth bass and occasionally some big striped bass. Fishing in all seasons, during every good and bad weather condition imaginable. I have competed in very few bass tournaments held on Pickwick Lake in recent years, but I have guided many professional bass tournament anglers (some coming from all over the world), to Pickwick Lake for the very first time. 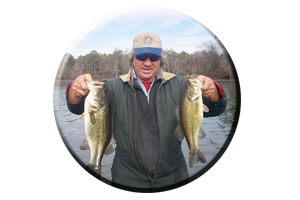 Often while taking these anglers in search of these bass we usually hook into a few trophy sized bass and in addition we often end the day with a decent days catch, fishing for both smallmouth bass and largemouth bass throughout Pickwick Lake. Often, they are rewarded with a handsome check afterwards, in return for the check they handed me for my guide services. Many anglers visit Pickwick Lake that do not tournament fish. They are not looking for numbers of bass, just one lone, trophy sized bass to put on the wall or to take pictures of and then release later. This can be a harder request for me to fulfill, for finding trophy sized bass is not like fishing for numbers of bass. First of all on Pickwick Lake, what would be considered a real trophy sized bass? Its all in the eyes of the angler that hooked and landed it! Lets say a child hooked into his/her very first smallmouth bass ever. Well, the jumping and thrashing antics alone would seem to be a trophy bass in any young anglers eyes. So possibly a 1-3 pounder could easily fill that bill! But let a seasoned veteran smallmouth bass angler hook into a 3 pounder and he will quickly reel it in, sling it in the boat, quickly unhook it and maybe admire it a second or two and then release it. Not even thinking of it as trophy smallmouth bass (unless he/she was a bass tournament angler and it was 15 inches in length), of which even most anglers with little smallmouth bass fighting experience would let go, to live and fight another day. Looking at most trophy sized smallmouth bass coming out of Pickwick Lake and previous world record holder (10 1/2 pounds) Wilson Lake upstream, a real trophy sized smallmouth bass would have to be one exceeding 6 pounds. This is a fish some anglers only land once in a lifetime. Anything bigger, would really turn the public eye for they are even more rare. So to just happen upon one of these line testing brown bass, on just any old fishing trip, would be a real bonus. They do exist, but with over 47,500 surface acres of water there is a lot of places they can live out their lives and avoid man on Pickwick Lake, like deep water. Like upstream Wilson Lake, Pickwick lake has its share of places that every angler fishes sooner or later. They are often called ‘community holes’. Like fishing below the dams. Around bridges, creek mouths, rock bluffs, both visible rock piles and man made rip-rap rocks lining banks. Points. Main lake flats. Islands. Just to name a few. And fishing any of these places is O K, for the bass have gotta eat in these spots no matter what fishing pressure exists. But mention deep water fishing on Pickwick Lake and most anglers will shrug their shoulders or keep very tight lipped. For those that know, all have some well guarded secret spots and GPS marked spots, places in deep water they would not share with anyone. You may have to find your own. A recent FLW Tour Bass Tournament was held on Pickwick Lake and it later aired on T V showing it to narrow down to the top 10 anglers. When it was all over, 4 of the top 5 winning anglers, including the eventual winner, were all fishing deep water. Lures from tube baits to jig combos, in weights of 1/2 ounce to over one ounce were used, fishing in 20-30 feet of main lake waters. 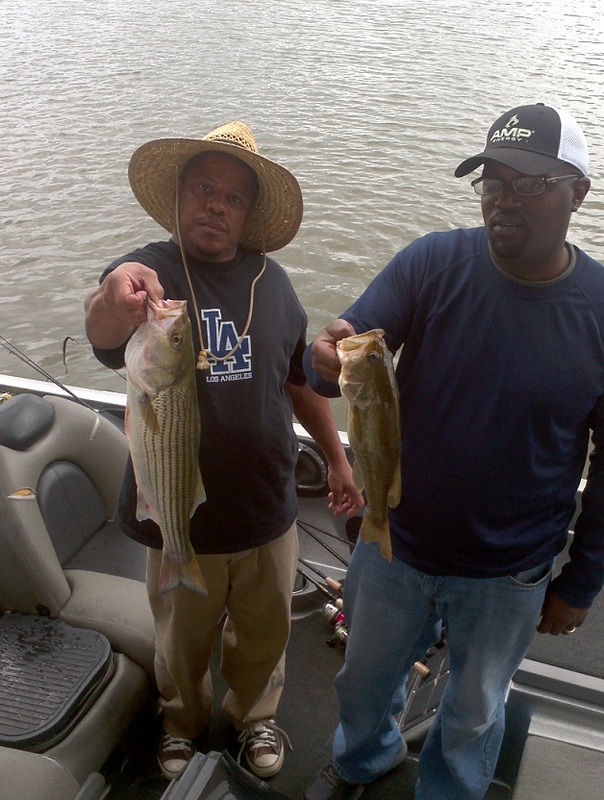 Some anglers finessed these Pickwick lake deep water bass, to bring in daily 5 bass limits, some exceeding 20 pounds! Summer and winter is generally when these bass go deep. Both largemouth bass and smallmouth bass can be taken in deep water all throughout Pickwick lake this winter season, especially when constant cold fronts lower the water temperatures inducing them to feed less, sending both them and the baitfish and crayfish they feed on to the deep. 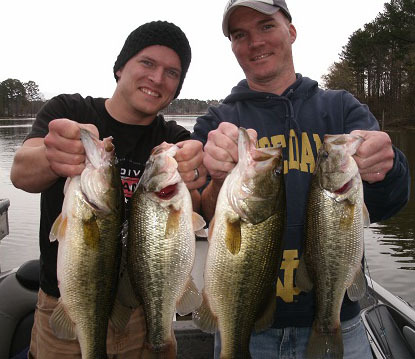 Even during winter warming trends these deep water bass remain in or very near deep water. Until the urge to spawn arrives next spring and they move shallow when water temperatures rise into the upper 60′s, most of these wintertime deep water bass will remain deep or close to deep water. There are still schools of nomadic bass that roam the lake in wolf packs visiting the shallows on any day on Pickwick Lake. These are both smallmouth bass and largemouth bass often mingling together in huge schools, bass that come and go real fast and you have to be there at the right time under the right conditions, to even get bit. 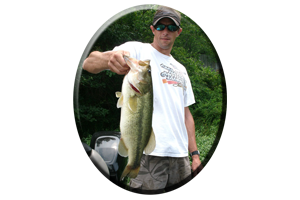 They are also feeding and often more active than deep water bass, bass that are generally dormant or off the feed. But deep water bass can be triggered to suddenly feed and often they can get into a feeding frenzy real fast, by an angler just hooking into one bass in the school. This is often witnessed as you see another bass or two following a hooked bass to the boat. Fishing slow with bottom dragging lures generally entices these deep water bass to hit an easy looking meal. But you can fish fast too with success. Jigging spoons, tail spinners or blade baits can be fished with a fast lift and drop presentation, enticing these bass to attack a struggling, erratic and injured looking meal. 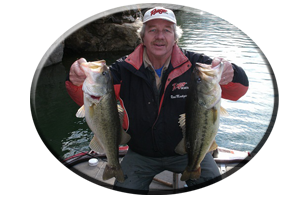 Fishing with deep diving crankbaits or utilizing a lift and drop method with lures like heavy spinnerbaits or lipless lures in 3/4 to one ounce sizes, works just as well. Not often thought of as a deep water lure, both soft bodied jerkbaits and suspending jerkbaits are excellent lures for enticing suspended bass in deep water to hit. So are slow sinking soft plastics like weightless worms, lizards, Slug O’s, Senkos and other soft plastics. Texas rigged worms in sizes of 8-10 inches, Carolina rigged plastics, or finesse fished plastics on jig heads are also popular lures for slowly enticing these picky feeders to bite. What else? Single tail grubs and twin tailed grubs, shad imitations, creature baits, crayfish imitations and slender skinny worms of all sizes. So if your not fishing deep water then now is the time to get out and explore the deep waters of Pickwick Lake. Some of the years biggest bass are taken during the winter months. But dress warm and bring plenty of warm food and coffee or hot chocolate and a G P S. It can get cold in north Alabama. 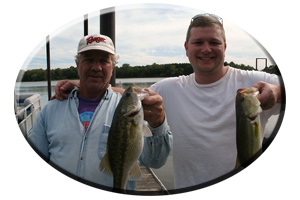 Or call on Reeds Guide Service and learn to fish Pickwick lakes shallow to deep water bass. 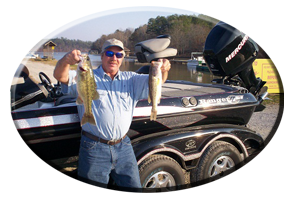 “Over 40 years exploring Pickwick lake in all seasons.” Remember, a guided fishing trip with Reeds Guide Service makes a great surprise Christmas gift, Birthday gift, Father’s Day gift, or good for any occasion, for those loved ones that love to fish. Remember, a guided trip with Reeds Guide Service to any lake in Alabama makes a great surprise Birthday gift, Fathers Day gift or Christmas gift (certificates available), for those loved ones that love to fish. Call today (205) 663-1504, or e-mail me at alabassgyd@aol.com for reservations this fall, winter or next year’s spring and summer seasons.